RokRez -The Ultimate Garage Floor Coating Kit- 100% Solid Epoxy -Duval Paint & Decorating, Inc. Announcing the most complete Do-It-Yourself Concrete Floor Coating Kit, the RokRez Ultimate 2 1/2 Garage Floor Coating Kit! 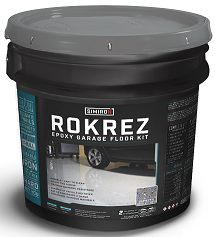 ROKREZ all-in-one epoxy garage floor kit converts aging concrete floors into vibrant, durable surfaces. Perfect for garages, warehouses and industrial floors, this unique formulated 2-component, 100% solids, high-build epoxy offers heavy-duty protection to any surface. ROKREZ's extended working time makes it easy to use and apply, while enhancing adhesion by enabling maximum surface penetration.